These are dishes at the top of the request list for lovers of Greek food. From simple to elaborate, they are ​classic dishes that delight Greek food enthusiasts the world over. From baklava to spanikopita, these are the must-try dishes from the Greek Isles. 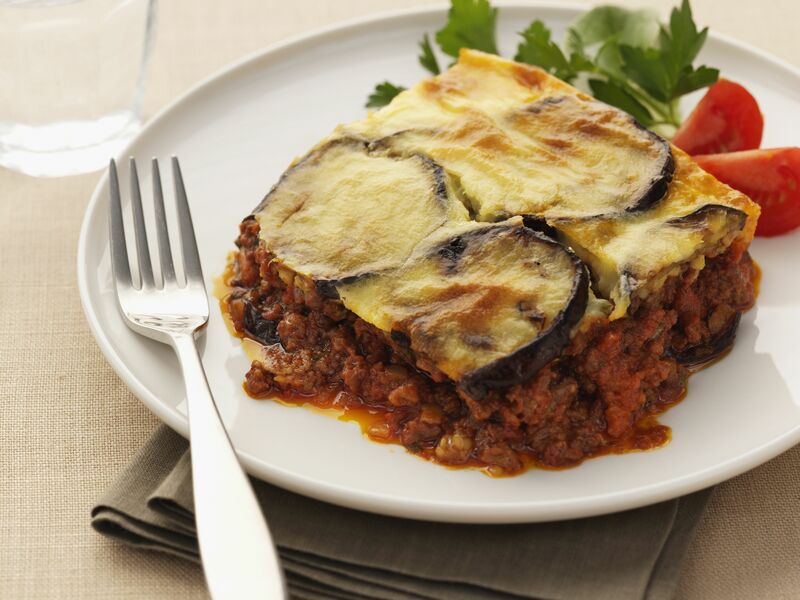 Perhaps the most widely recognized of all Greek dishes, this moussaka, an oven-baked casserole of layered eggplant and spiced meat filling topped with a creamy bechamel will be the highlight of any Greek meal. It can be time-consuming to prepare, but it will delight your guests. Baklava, a perennial favorite, and a classic Greek pastry are made with flaky phyllo dough layered with a cinnamon-spiced nut filling and bathed in sweet syrup. It’s crunchy, sweet, and very decadent. Greeks love their leafy greens and for a good reason. They are healthy and delicious. Packed with nutrients and flavor; Horta vrasta will compliment any meal. Serve with a drizzle of olive oil and a squeeze of fresh lemon juice and enjoy. The ultimate in Greek comfort food, this chicken soup avgolemono is a hearty and delicious staple of any Greek household. A traditional soup finished with a creamy egg-lemon flavor; it is sure to become a family favorite. Tzatziki, a tangy cucumber dip flavored with garlic is the perfect complement to grilled meats and vegetables. It's served on the side with warm pita bread triangles for dipping and is also used as a condiment for souvlaki. Three essential components make up this pastitsio dish - pasta, meat filling, and a creamy bechamel sauce, all layered in a pan and baked to golden perfection. But you'll have a messy kitchen as each of those requires its own separate preparation. You'll dirty a few pots and pans making it, but it will be so worth the effort. Galaktoboureko may be hard to pronounce, but so easy to eat! This custard-filled phyllo pie is an outstanding Greek dessert, drenched with a lemon and orange-infused syrup. It's rich, creamy and so delicious that you will want to make it again and again. Greeks will make almost anything into a pita or pie, especially fresh greens like spinach, which is why spanakopita is such a hit. This tasty pita happens to be so popular, it's popping up in mainstream grocery store freezers everywhere you turn. Why buy the frozen stuff when you can make your very own mouthwatering pan? Youvetsi is a traditional beef stew in a rich tomato sauce that's baked in a clay oven with delicious orzo pasta and topped with a heap of grated kefalotyri cheese. This hearty and delicious one-pot meal is the ultimate Greek comfort food. Stuffed with rice, pine nuts, and fresh herbs, dolmathakia (dol-mah-THAH-kya) take a little bit of time to prepare, but the result is a volatile appetizer or main course, depending on how many you make. These can be served warm or cold. The Greek meze (meh-ZEH) or appetizer table would not be complete without this traditional taramosalata spread. While it used to be made with a mortar and pestle, you can use a food processor. Serve with plenty of fresh bread for dipping. Vegetable dishes that are cooked with olive oil and tomatoes are referred to as lathera (lah-the-RAH) in Greek because the key ingredient is flavorful olive oil, or “lathi.” This fassolakia lathera is a great way to prepare fresh green beans as a side dish or a vegetarian main meal. Delicious walnut cookies doused in a cinnamon flavored honey syrup and then topped with more chopped walnuts. A classic Christmas offering, this melomakarona cookie is unlike anything you've tasted before. Souvlaki (soo-vlah-kee) is the term used to describe “little skewers” of meat that are marinated in a wonderful red wine marinade and then grilled. Serve this pork souvlaki with tzatziki on the side. Domates yemistes is a Greek staple of the summer season when tomatoes are abundant and at their peak. You can also use the same filling for peppers, zucchini, or any other vegetables that may be available. The traditional bread of Greek Easter, Tsoureki is a rich yeast bread flavored with orange and a delightful spice called mahlab (also called mahlepi) that is ground from the pits of wild cherries. Keftethes (keh-FTEH-thes) are savory Greek meatballs that are served as an appetizer or meze (meh-ZEH). The traditional recipe calls for frying the meatballs, but this baked version is quite good and just a bit healthier. A Greek family celebration wouldn’t be complete without the delightful buttery goodness of kourabiethes (koo-rah-BYEH-thes). These are very rich cookies (as are most shortbread cookies) yet somehow lighter and melt in your mouth good. Be sure to make extra because these will go fast. These finger-friendly tiropites are made with phyllo pastry sheets and filled with a delicious mixture of Greek cheeses. You can prepare them and freeze them to bake for a great snack whenever you wish. What Are Good Greek Food Recipes Anyone Can Make?